Metro must replace faulty wiring on every single one of its new 7000 Series rail cars in a process that could take a year or longer, according to a new internal review that also found other significant issues tied to the rail car manufacturing program. WASHINGTON — Metro must replace faulty wiring on every single one of its new 7000 Series rail cars in a process that could take a year or longer, according to a new internal review that also found other significant issues tied to the rail car manufacturing program. Since the cars first went into production in 2012, wire crimping has never been done properly, a review by Metro’s Quality Assurance, Internal Compliance & Oversight office found. That has contributed to incidents where rail cars have problems that can create significant delays. As of last month, Metro had accepted and placed into service 548 of the rail cars. Each of those cars will need to be taken out of service for a time to have its wiring replaced. The repairs would likely be done in phases, not all at once. The agency expects to receive the last of the 748 cars on order by next summer to replace older cars, although the wiring issues and other problems have delayed deliveries recently. From the beginning, Metro failed to require that the car manufacturer, Kawasaki, perform appropriate quality checks and provide engineering design support, the review found. The contract for the cars also failed to provide specific consequences for failing to provide certain work that measured up to standards. There are penalties based on more broad performance metrics. The internal review dated Aug. 3 was conducted in May and June and completed in July. It included interviews and observations at the Lincoln, Nebraska, manufacturing plant and with Kawasaki officials at offices in Yonkers, New York. Besides the wiring issue, the review found that in May 2016, cars arrived at Metro with an average of 22 issues that needed to be addressed. As of May 2018, that number had dropped to an average of six per car, but most of those remaining issues were things like software upgrades that had been requested more than a year earlier yet had not been resolved. The issues that have most significantly delayed delivery or use of the rail cars include welding and painting failures that Metro had not controlled. Over 90 percent of issues Metro inspectors found at the plant in Nebraska were tied to welding, painting or the wire crimping failures. “During the assessment conducted at Kawasaki Motors Manufacturing, it was discovered that wire crimping defects went undetected by Kawasaki and were found by WMATA’s Resident Inspectors, resulting in defects that require rework on all 548 on-site at WMATA. This will result in rework that will take over one year to accomplish,” the review said. In the D.C. area, the review noted Metro is using an entire rail car maintenance facility and related personnel to work on a fix to a separate issue for more than 200 of the 7000 Series rail cars that will take more than two years. The review called all of the fixes needed after the cars arrive at the Greenbelt Rail Yard a burden on Metro resources that could otherwise be used on other maintenance to prevent delays. “Including stronger contract language for reporting on manufacturer’s internal quality findings can reduce oversight costs for the Authority through more data driven reviews and inspections,” the review said. 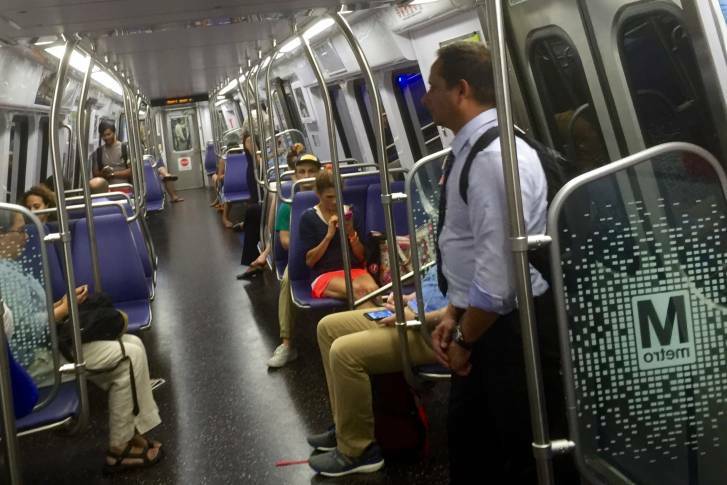 Separately, Metro has been negotiating with Kawasaki and the Federal Transit Administration on safety fixes for the cars meant to protect visually-impaired riders from falling onto the tracks. Those fixes are now expected by May. At the Nebraska plant, Metro’s regular inspectors are largely checking the rail cars at specific points in the process rather than monitoring ongoing work such as the wire crimping that ends up covered up when manufacturing is complete. “Workmanship defects related to wiring and crimping … were identified during a surveillance inspection and would not have been identified during hold point inspections due to concealment through the normal installation process,” the review said. Metro promised to request additional data from Kawasaki on a weekly basis until manufacturing is complete next year and to update any future contracts for the next round of new rail cars to address the concerns raised in this review. Regular review meetings on new technical specifications will also begin in coming months.